Ensuring your Gutters are clear and clean is an important part of weatherproofing and maintaining your home. Waiting to find a problem with your gutters is, in most cases, too late. Your property will have already suffered water damage. Water trapped in gutters can cause major damage to your roof and walls; this is caused by leaves, moss and debris falling into the gutters causing them to become clogged. It is also important to ensure gutters are cleaned before the winter as any water pooling in gutters will freeze and turn into a heavy block of ice, this in turn can lead to forcing the gutter away from its mounting and the proper angle of the gutter becomes distorted. A regular routine cleaning of your gutters can easily prevent these problems, as well as maintaining an attractive appearance for your home. Gutter systems should ideally be thoroughly cleaned twice a year to avoid costly repairs and roof damage. This state-of-the-art system is safe and reliable and removes all debris from the gutter using our ladder-less equipment. 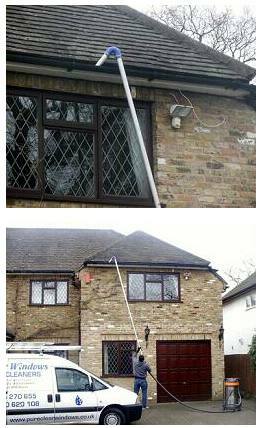 The ‘Gutter Vac’ has a telescopic pole which reaches into the gutter and collects the debris in a large collection bag. Cleaning is done efficiently and safely with no mess. Or fill in our contact form for further information.